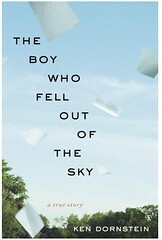 I picked up this book, The Boy Who Fell Out Of The Sky via a gift card for my birthday. I am still in it, so this may be premature, but what is becoming evident is what a strangely interesting book it is. It has it’s morbidity and overly detailed descriptions of what it might have felt like to have been sitting in a seat on Pan Am flight 103 when it exploded over Lockerbie, Scotland. I couldn’t help but see scene after scene from the TV show “LOST” running through my head as I read it. It's more than an account of the event. It is an exploration of how the event defined a story. Ultimately, though, the timing of this book, it’s publishing at this point in America’s story, seems pertinent. It’s an event that is old enough that we are disconnected from it, but it is also familiar to anybody who woke up that Tuesday morning on September 11, 2001 to hear that terrorist had notched it up. It emphasizes that every person has a story, a story that had a beginning long before it ended. And no story is insignificant.